This is my finished piece for the first challenge of the year. Fast Friday started as an off-shoot of the Quilt-Art list several years ago. The premise is for a challenge to be offered, and each member is to complete a piece within a one week time frame. This piece is not necessarily intended to be elegant or carefully and painfully executed, but more of a sketch but with fabric. The challenge this month was to use line as a design element and complementary colors. In addition, all the pieces this year are to be part of a series. Other members have chosen some interesting topics such as phases of the moon, ports of call, trees, and so forth. I chose ‘TOPES’ pronounced ‘toe pays’. If you have ever driven in rural Mexico, you will have seen the signs warning ‘Topes’. These are either small bumps or troughs or both but act as physical encumbrances to fast driving through small villages. While everyone else was taking pictures of the burros or sheep or children, I was taking photos of the topes. In addition to the stipulations set forth by the challenge, I also wanted to use my needle felter and work strictly from my scrap-bags. 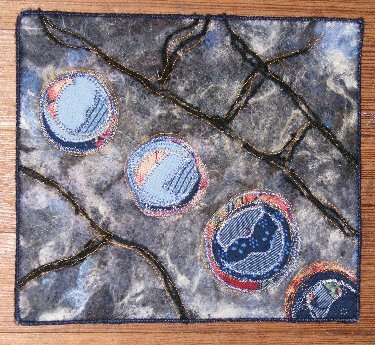 The background is needle-felted wool on a cotton classic batting, wool yarn, appliquéd cottons, and stitching with a variegated blue rayon thread and orange trilobar. The backing is a pieced cotton, the edges are finished with a narrow zig-zag over black wool needlepoint yarn. Completed size is 7 by 8 inches.